Check that the following fuse is not fusing. Check ground connection E9 and E15. Refer to GI-42, "Circuit Inspection". 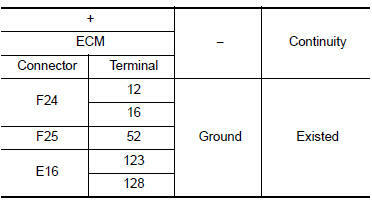 Check the continuity between ECM harness connector and IPDM E/R harness connector. Is the inspection result normal? YES >> Replace IPDM E/R. Refer to PCS-58, "Removal and Installation" (with intelligent key), PCS-58, "Removal and Installation" (without intelligent key).